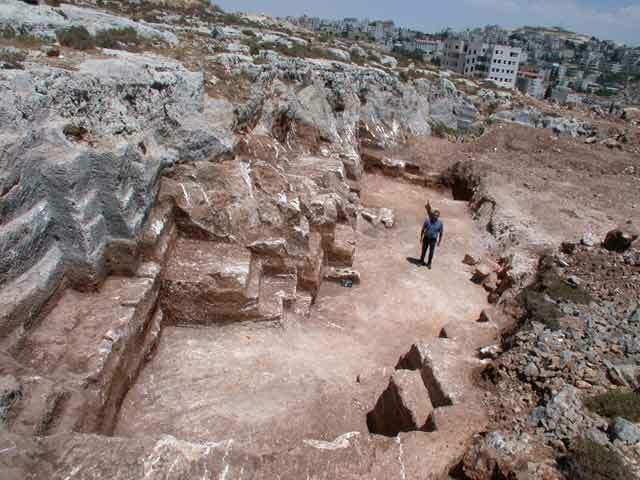 During August 2001 and June and August 2002 salvage excavations and documentation were conducted in three quarries (1–3) in the Beit Hanina neighborhood of Jerusalem, prior to construction. The excavations (Permit No. A-3662*), on behalf of the Antiquities Authority and financed by A. Taiya (1; map ref. NIG 22110/63715; OIG 17110/13715); N. ‘Iit (2; map ref. NIG 22092/63769; OIG 17092/13769) and N. Abu Khalaf (3; map ref. NIG 22102/63724; OIG 17102/13724), were directed by Z. ‘Adawi, with the assistance of A. Hajian, V. Essman and V. Pirsky (surveying), B. Zissu (photography), D. Weiss and L. Barda (GPS measurement), G. Solimany, T. De‘adle, B. Touri and H. Abu Ta‘a. Quarries 1 and 3 were located on one hill, south of the road leading to Beit Hannina. Quarry 2 was located on another hilltop where some 30 quarries were recorded with the aid of GPS along its peak and upper sections. All three quarries were first exposed by mechanical equipment and later manually excavated. Intensive quarrying activity in the hard bedrock was evident in all three of them, yet no datable finds were discovered. Quarry 1. The quarry is on the northwestern slope close to the hilltop. Three sections that were slated for construction were excavated. The upper alluvium layer overlaid a layer of quarrying debris. The quarrying in the first section (1–2 × 12 m), which occupied the northwestern part of the excavation area, was done along 5–6 levels to a depth of 2 m in the east, west and south. 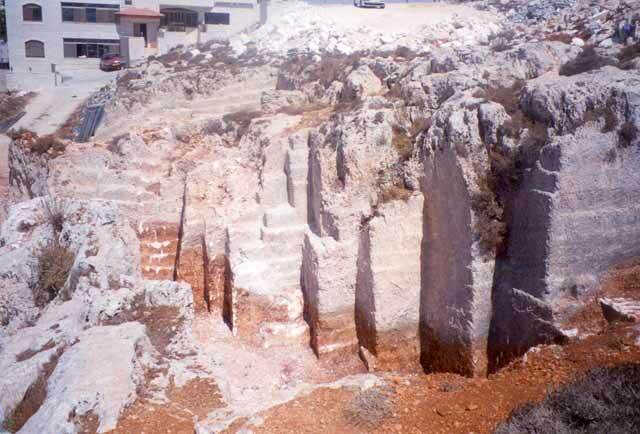 The quarried stones had varied dimensions (0.6–0.9 × 0.2–0.5 × 0.3–0.9 m). Hewn severance channels (5–7 cm) were occasionally discovered around the stones that were slated for removal. The second section (8 × 10 m) was in the middle of the area’s northern part. The quarrying was done in several levels to a depth of c. 2 m, in an east and west direction. The stones were hewn in a variety of sizes (0.5–1.0 × 0.4–0.6 × 0.3–0.5 m) and the severance channels ranged from 5–10 cm in width. The quarrying in the third section was apparently performed in all directions, but the western part seems to have been damaged by mechanical equipment. The dimensions of the stones varied (0.5–2.0 × 0.5–0.9 × 0.3–0.4 m) and the severance channels were c. 10 cm wide. Quarry 2 (Fig. 1), located at the top of the hill, was covered with three layers. The upper layer contained a few fieldstones that originated from modern rock-cutting, the second layer (2–3 m) was dark brown and contained small and medium-sized fieldstones from the top of the hill and the third layer (0.3–0.5 m) was white gravel (quarry debris) with stones that were removed from the quarry but their dressing was not completed. Three to four levels of rock-cutting were found in the quarry; the upper level was severely damaged by modern quarrying that utilized explosives. The quarry (max. dimensions length c. 30 m, width c. 7.5 m depth below surface c. 4 m) extended to the south beyond the boundaries of the excavation. The stones had varied dimensions (0.7–2.0 × 0.3–1.2 × 0.3–0.5 m) and the severance channels were 7–10 cm wide. Quarry 3. Two sections, mostly exposed before the excavation, were discovered. The first in the west (max. dimensions 17.5 m long, 14 m wide; Fig. 2) was located in the middle of the hill’s northern slope. The quarrying was done in several directions, thereby creating a ‘courtyard’ surrounded by walls, in which two openings that were meant to facilitate the removal of the extracted stones, were discerned. One opening (width 0.9 m) was in the quarry’s northern wall and the other (width 0.7 m)––in the southern wall. Furthermore, the quarrying activity created corners, steps and vertical surfaces that reached 7 m in height; some were very wide and others narrow and crowded. The dimensions of the hewn stones were varied (0.7–2.5 × 0.3–0.7 × 0.3–1.0 m). Throughout the quarry rectangular and trapezoid severance channels (7–15 cm) were discerned. An accumulation of alluvium at the bottom of the quarry, which included a small amount of quarrying debris that originated from the slope of the hill, overlaid a layer of quarrying debris (max. thickness 0.5 m). The second section was several meters east of the first and the scope of quarrying in it was smaller, reaching 3.5–4.0 m in depth. The quarrying was deepened to the bottom of the quarry in the middle of the northern wall and the opening that was thereby formed probably facilitated the removal of stones. The quarried stones had varied dimensions (0.4–2.5 × 0.2–0.8 × 0.3–1.0 m). The severance channels had a maximum width of 10 cm. The ‘courtyards’ in the two quarries, as well as the openings and narrow steps on the upper level of the western section indicate intentional activities and advanced planning, which were mainly meant to allow the easy removal of stones. The three quarries and the numerous other quarries that were discerned on the two hills probably served several sites in the vicinity, such as Kh. ‘Addasa to the north (Survey of Jerusalem, the Northeastern Sector: Site 4), Kh. el-Biyar to the west (Archaeological Survey of the Hill Country of Benjamin: Site 319), Er-Ras to the south (Survey of Jerusalem, the Northeastern Sector: Site 114) and Tell el-Ful to the east. 1. Quarry 2, looking east. 2. Quarry 3, looking northeast.